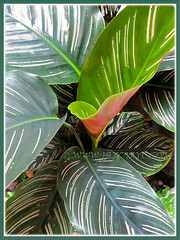 This versatile tropical plant that showcases dazzling variegated leaves had us really smitten when we first sighted it. That was about four and a half years ago when we visited the Sungkai Wildlife Conservation Centre in Pahang. Then, it was out of sight, out of mind until late last year when we had to source for some variegated foliage plants for our courtyard. The quarter-moon pebbled border therein seemed somewhat bare, with many potted plants being ‘devoured’ by mealy bugs and spider mites. Hence, there was an urgent need to replenish the emptiness. Fortunately, during our plant-shopping spree, we came across several potted Calathea ornata ‘Sanderiana’ that were readily available for sale at a garden centre in the neighbourhood. Unbelievably cheap, just RM5/pot and we grabbed one without hesitation for our garden. This gorgeous plant with impressive variegated foliage fitted the bill perfectly! The large oval-shaped and olive green leaves are really attractive, and the fish-bone pattern of white and light pink lines on them provides a wonderful and eye-catching contrast. 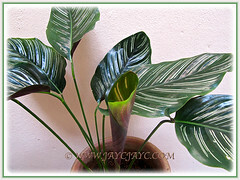 Besides, the Pin-stripe Plant or Calathea Broad Leaf is such a hardy and low-maintenance plant that’ll evidently add beauty to your home, indoors or outdoors. Botanical Name: Calathea ornata ‘Sanderiana’ (syn: Calathea sanderiana, Calathea majestica, Calathea regalis [all 3 were previously considered distinct species, but now regarded as varieties of C. ornata], Calathea arrecta, Maranta albolineata, Maranta ornata/regalis) and others as stated at The Plant List. 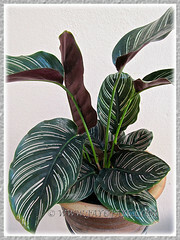 Common Name: Calathea Broad Leaf, Striped Calathea, Pin-stripe Plant. Etymology: The genus name, Calathea comes from the Greek word, kalathos, meaning a basket, in reference to the inflorescences borne by some species. The species epithet ornata is from the Latin ornatus, meaning adorned, embellished or ornate. Origin: ‘Sanderiana’ is a cultivar of Calathea ornata that is native to Columbia and Venezuela in South America. 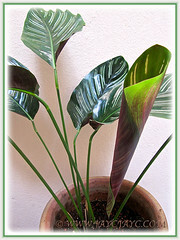 Plant type: An ornamental herbaceous tropical perennial. Features: Calathea ornata is an attractively beautiful species of the genus, Calathea that consists of about 300 species and many cultivars, varieties and hybrids that are valued for their decorative foliage. It is an evergreen herbaceous perennial that grows moderately to about 1 m tall and spread to 0.6 m or more in width. A clump-forming plant with an upright habit that reproduces vegetatively by underground rhizomes. 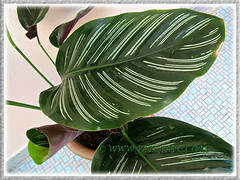 Calathea ornata ‘Sanderiana’ produces large, elliptical, glossy and leathery leaves that are dark or olive green above and uniquely patterned with a feathered or fish-bone design of distinct white lines, occasionally with pink overtones. The pink tint tends to fade as the plant matures. The underside of each leaf is maroon or plum red. Their eye-catching broad blades are held atop stiff and medium green petioles that emerge from the crown. The petioles which are covered with leaf sheaths at the base grow up to varied heights, presenting a lovely multi-level display. Like many species of the Marantaceae family, Calathea ornata is no exception. It has the characteristic feature of folding up their leaves by means of a tiny joint in the leaf stalk, from dusk onwards or on cloudy days, like hands held upright in prayer. And, in the morning till early evening, the leaves will return to normal position, that is, almost perpendicular to the petioles. Flowers are rarely produced in cultivation. When it blooms once in a while, the inflorescence is ovoid, with white or mauve tubular flowers and yellow-orange bracts, spirally arranged. Two popular cultivars of Calathea ornata available on sale at our local nurseries are ‘Sanderiana’ and ‘Roseo-lineata’. By comparison, the latter is a smaller plant (up to 60 cm tall) with narrower and longer leaves, whilst ‘Sanderiana’ reaches to about 1 m in height and has broader and shorter leaves. 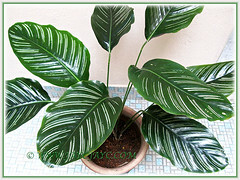 Culture (Care): Calathea ornata can be somewhat easily grown if the conditions of tropical rain forest where it originated is maintained, that is, providing it sufficient water, warmth and high humidity. Light: Bright indirect light or filtered light to partial shade as direct sun bleaches, burns and curls the leaves. Tolerates low light or full shade but may slow growth and results in dull-looking foliage. Moisture: Average water requirements – water moderately and regularly, preferably with rain water. Overwatering can cause root rot. At lower temperatures, water sparingly and allow soil surface to dry slightly between watering. Soil: Nutrient enriched soil with a mix of sand that is evenly moist yet free-draining. Others: Feed once monthly with a fertilizer for foliage plants. It is sensitive to salt accumulation from unabsorbed fertilizer salts that will cause leaf margins to curl, so flush the soil occasionally with water to neutralize it. Excessive wind can also cause curling of leaves. 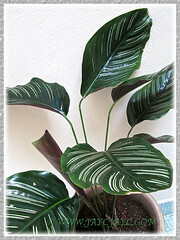 Calathea ornata is intolerable of dryness in the air and requires high humidity to prevent browning of leaf margins. For an indoor plant, use a room humidifier, mist it regularly or stand it in a saucer of pebbles filled with water almost to the base of pot to maintain humidity. To keep plant tidy, prune off brown or withered leaves together with petioles, and spent flower heads if any. Being a rhizomatous perennial, it can stand being cut back to ground level if plant seemed unhealthy or unsightly and new growth will eventually emerge. 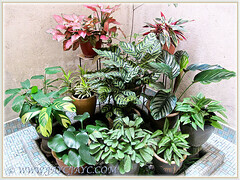 Re-pot only when it is overcrowded or the need to propagate arises as it likes to be pot-bound. 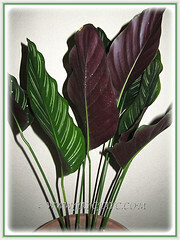 Calathea is prone to attack by spider mites, otherwise relatively free from pests and diseases. For subtropical and temperate regions: Hardiness: USDA Zone 10. 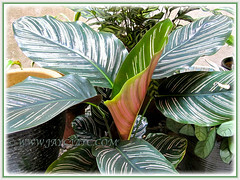 Calathea ornata is frost sensitive. Keep plants in a draught-free location and ensure constant moderate-to-high temperatures as draughts may cause leaves to curl. Water and feed sparingly in winter but water well during summer and maintain high humidity by misting as best as you can as it does not tolerate dry air. Brown leaf margins is a sign of insufficient humidity. Provide bright light at all seasons but avoid direct sunlight that will burn the leaves. To propagate new plants, best to divide the crowded clumps when you repot them in the spring. Propagation: By dividing crowded clumps. Separate the plants carefully and ensure that each division has a few leaves and strong roots intact. Pot each division individually in a good potting medium and firm the soil around the roots. Wet soil thoroughly, drain and site at a partially shaded spot, misting regularly during the early stages to ensure success. 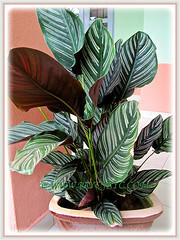 Usage: Calathea ornata ‘Sanderiana’ is an impressive decorative foliage plant that is most ideal as a container plant, located indoors as a houseplant in homes or offices, and outdoors in the garden, porch, deck, patio, etc. Excellent too, when placed amongst a crowd of other foliage plants as seen in the right image. It can be used in mass planting in garden beds or borders or as groundcovers under large shady trees. An attractive tropical ornamental plant that will look great as a stand-alone specimen or grown in front of a shrub border as well. Aphelandra squarrosa is too gorgeous to resist!